Frankly, we could not be happier to see our clients embrace the term intentional to describe strategic and managerial priorities. For far too many law firms, for far too long, many aspects of firm and practice management have been anything but intentional. On the contrary, many firms – including many with smart, well-conceived strategic plans – accommodated highly autonomous action on the part of practices and (especially) successful partners. Firm strategy was essentially subservient to the needs and interests of individuals and small groups within the firm. 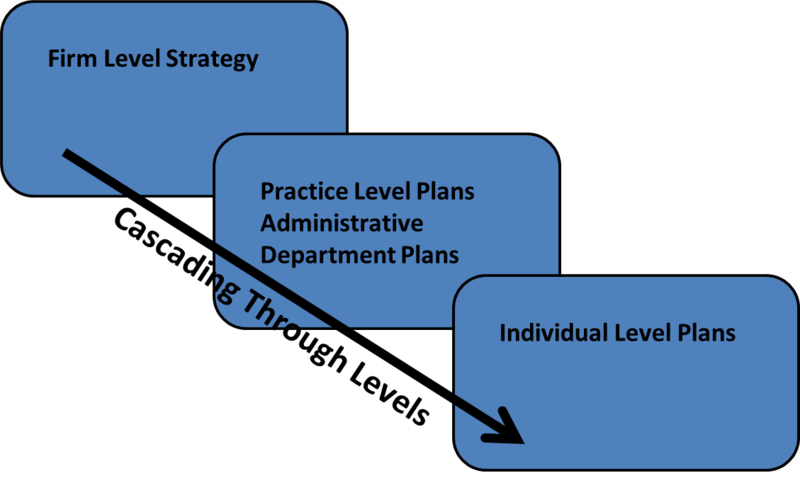 In his landmark article “Patterns in Strategy Formation,” (pdf) Henry Mintzberg accurately characterized this as the strategy of “muddling through.” This approach is inherently reactive and leads to continual bargaining vis-a-vis priorities and goals. As a result, strategy is fragmented and often reflects the narrow interests of powerful individuals, rather than the proactive pursuit of best opportunities available to the organization as a whole. Sound familiar to anyone? What do we mean by “intentional management?” It simply means saying what you mean (i.e., being clear about the direction the firm is heading and the priorities it will adopt in its pursuit) and doing what you say (i.e., following through on those priorities). Now, it is easy to define intentional management, but more difficult to live it. Living it requires linking strategy across and through the firm. It also requires actively managing, monitoring and measuring progress toward the firm’s primary goals. Passively waiting for annual (or less frequent) partner compensation discussions is not sufficient. There need to be clear commitments to action at the firm, practice, departmental, and individual level. And, the whole endeavor benefits immensely from tracking what is working (and what is not working) via outcome measurement. After all, we adopt strategies and implement those strategies with particular outcomes in mind (e.g., revenue growth, improved realization, stronger client relationships, a more effective work force, etc.). If we are following through on our commitments (i.e., managing intentionally), then we can use outcome measures to identify what is working, make appropriate adjustments, and challenge the strategy when circumstances dictate. We need to be intentional in our approach to people management – especially in recruiting, training and professional development. Client relationships benefit from intentional management. That is particularly true for relationships threatened by clients’ demands for greater value and/or cost reduction (e.g., where project management, knowledge management, or other aspects of the ACC Value Challenge are in play). It is also true of relationships that can benefit from greater breadth and/or depth (i.e., where others in the firm can help substantially in cementing the client relationship). It is certainly a requirement for effective business development if that is going to be anything more than heroic individuals going to market on behalf of the firm. Any meaningful targeting, leadership in industry segments, and/or team-oriented selling is a function of intentional management. Pricing decisions (e.g., rate setting, creation of alternative fee arrangements) and other basic economic decisions (both revenue and cost related) benefit from intentional management. Finally, the ultimate decision of who owns the law firm (and at least here in the US, that means who becomes and remains an equity partner) should be driven entirely by intentional management. So, three cheers to the firms out there embracing an intentional approach to management. It will serve you well as the legal marketplace becomes increasingly competitive.